From its stylish looks down to its ferocious direct injection, intercooled diesel engine; this dynamic truck is a reliable worker that is more than up for all the short haul freight that you need done right, the first time. The versatile body can be modified to suit most transportation needs, from regional haul to moving refrigerated cargo. This truck can do it all. 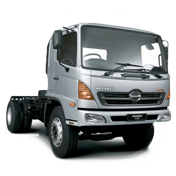 Download the latest Hino 500 brochure with the vehicle specifications below.